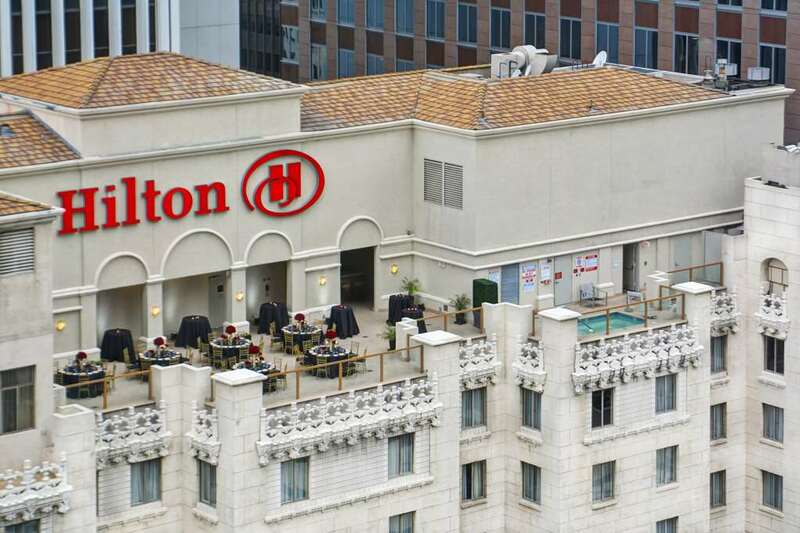 The Hilton Checkers Los Angeles hotel is recognized as the finest hotel for the discerning business traveler in downtown Los Angeles California. The Hilton is the downtown area*s only deluxe European-style boutique hotel. Located in the heart of the business and financial district of Los Angeles the historic Hilton Checkers Los Angeles hotel is only blocks from the LA Convention Center Music Center Staples Arena and Disney Concert Hall in California. Guests at the Hilton Checkers Los Angeles hotel will experience our beautifully appointed guestrooms with an elegant residential feel. Featuring high-speed Internet access 27-inch flat screen televisions 54-inch marble desks Luxurious leather desk chairs. On our open-air rooftop deck overlooking the downtown area guests of the Hilton Checkers Los Angeles hotel may enjoy the pampering of Checkers Spa featuring a whirlpool exercise room steam room and sauna. Checkers Spa offers the latest in massage therapies in a truly luxurious California atmosphere including fine art soothing music and relaxing colors. Take the guest elevator to the rooftop for a *one of a kind* experience in California. Checkers Restaurant is consistently rated by Zagat and Gourmet Magazine among the finest dining rooms in Los Angeles California. Serving breakfast lunch dinner Sunday brunch and afternoon tea Checkers Restaurant is a restful retreat from the business day. Guests may also enjoy the gourmet cuisine of Checkers in any one of our private hotel meeting rooms which accommodate groups of up to 120 people. Reminiscent of a private club the Hilton Checkers Los Angeles hotel offers a private secured entrance with key-only access to the guestroom floors via our guest elevator. Room Service: Enjoy dining options from Checkers Restaurant from the comfort of your room.